Hello! We are back with our second inspirational project here on the blog today. 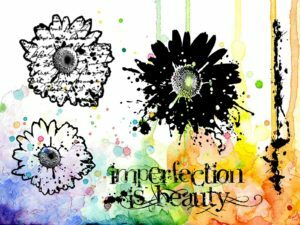 Hello everyone and welcome to my blog post! 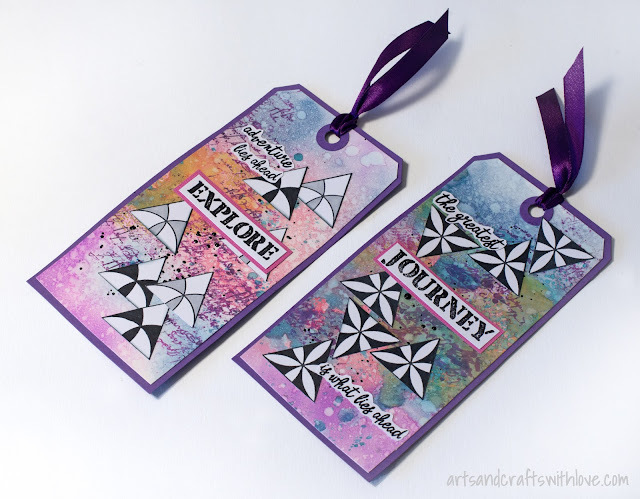 Today I’m sharing (yet another) DT make for Visible Image and today’s uses both Elemental and Glimmer of Light stamp sets. 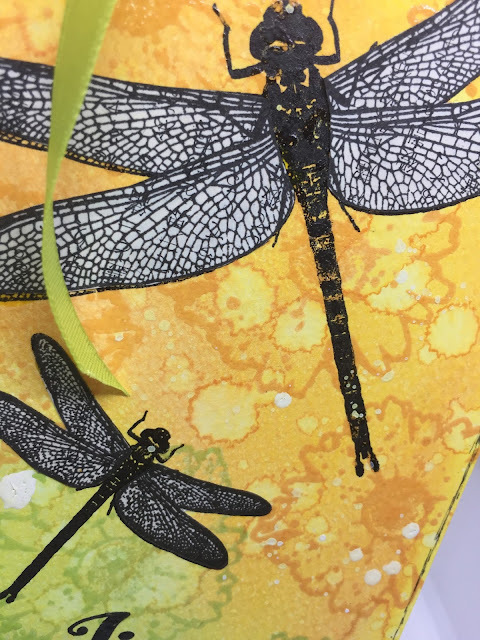 Having just purchased all the new gorgeous Distress Oxide ink pad colours, I gathered all the neutral colours (Frayed Burlap, Antique Linen, Gathered Twigs and Iced Spruce) and made an inky background to which I added some gold spritzing ink for a hint of shimmer. 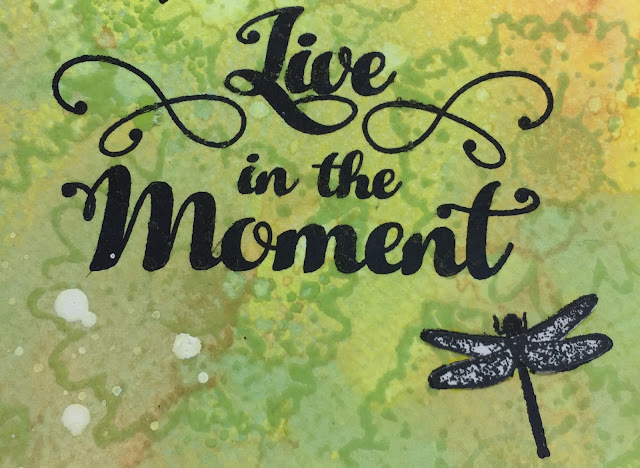 I love the textures you can make with the Distress Oxide ink pads… perfect for stamping over! 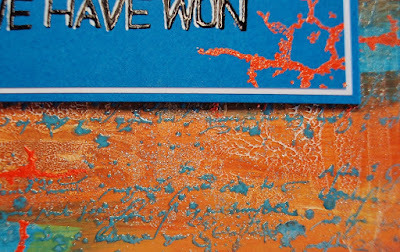 Once this was dry, I heat embossed the Elemental stamp in Wow!’s Metallic Copper. If you never used heat embossing powder, it is just mesmerising to watch it melt and I particularly fond of the copper colour way as it really adds a warmth to your projects. To add the light bulbs, I stamped these in black Stain ink and coloured using Distress Spray Stains in Mustard and Spiced Marmalade and then added Ranger’s Glossy Accents to make them shine and give a glass effect. Once fully dry (allow to air dry) I threaded some floristry wire through a small hole and twisted the wire to secure it’s position. Having given the top a little twirl, I adhered them to the card using 3D foam dots (under the bulb) and a small strip of masking tape to the wire. For the large Moth, simply heat emboss in Wow!’s Sea Foam White and fussy cut him out. To add a slight hint of colour, I’ve used a gold spritzing ink to paint on some extra sparkle. Once finished, secure him to the card using 3D foam dots. And there you have it, although in hindsight I would’ve stamped the Moth a few times and layered up his wings using vellum or acetate but maybe next time! Have a lovely Sunday whatever you’re doing, and hope to see you on over in the Visible Image Facebook group soon. We will be back with more projects from our amazing team this afternoon.. so stay tuned! Hi there! Apologies that we have neglected our blog for a few days.. we needed to spend every minute dispatching orders and continuing with the unpacking in our super new premises! Our Design Team have lots of gorgeous new projects so we’ll be catching up with them over the next few days. Today is my weekly Design Team inspiration for Visible Image. This week I chose to use another of the fab older sentiments which works perfectly for my post today. This stamp has such a unique typeface. I have often used the “eye” as a partner for this stamp but I decided I wanted to showcase this great sentiment all by itself. 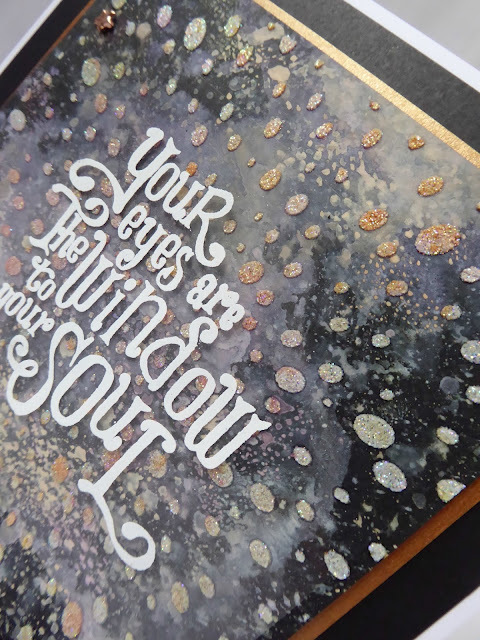 I had the idea to stamp the sentiment on clear acetate “window” and then create a very textured starry sky. 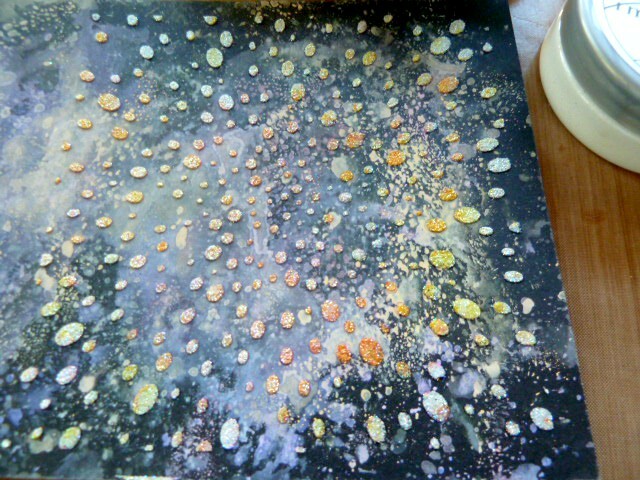 This is my Distress Oxide starry sky.. I made my “window” and used little star brads in each corner to attach my sentiment. 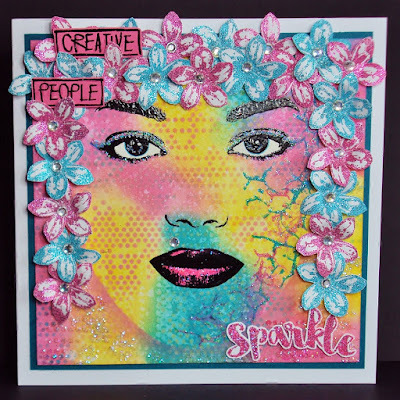 In real life it has a very textured sparkle, just like the sky at night twinkling..
We will be back later with fabulous inspiration from Heather Mitchell featuring another of our stencils! Hi there! As promised we are back with more stunning inspiration this evening. 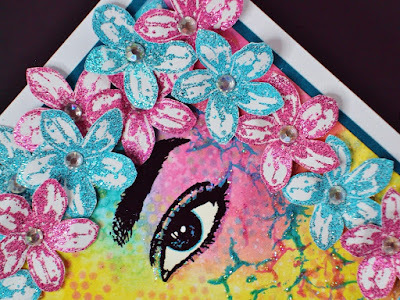 This week I’m sharing another card that focusses on one of Visible Image’s sentiment stamps. I love this stamp, perfect for so many situations. My background was created using Distress Oxide inks (everybody’s new favourite toy). I then stamped the script stamp randomly all over. I die cut a circle from another piece of cardstock and coloured with Distress Oxides to match. I then stamped the sentiment with Versamark and embossed with Eggplant WOW Powder. This month sees the start of our new monthly themed challenges in the Facebook group (link below). Our theme for May is Express Yourself – Use Words as the Focus of your Project. 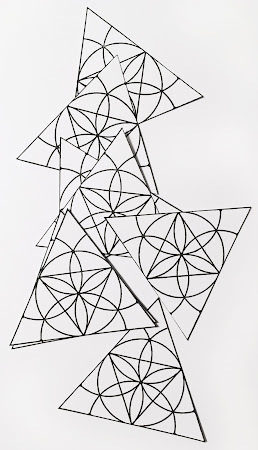 And if there wasn’t enough Visible Image inspiration around already…. check out the new issue of Craft Stamper magazine, where myself and some more of my talented teamies share our monolith projects with you!! Thanks for stopping by – don’t forget to check out the links below!